First up, Triad of Fates. 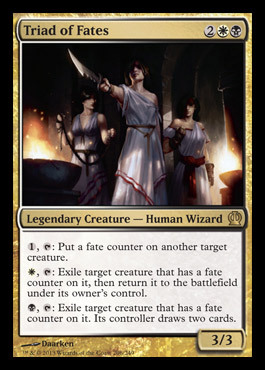 Pretty powerful card if you look at each ability, but the fact that each requires tapping, this is definitely more of a casual/EDH card. Pretty interesting and fun mechanics, though. Second, Firedrinker Satyr - a strict Jackal Pup upgrade. A "pup-grade," if you will. While this card will make an interesting splash in standard, I'm not quite sure how powerful it will be. Third up on the list is Dauntless Onslaught - we finally get a decent pump spell that helps trigger the Heroic mechanic. Unfortunately, I don't think it's good enough for constructed - but it'll be a blast to play with in limited. Lastly, Keepsake Gorgon is a decent body with an expensive kill spell attached. It's definitely no Shadowborn Demon or Nekrataal, but it's removal - something that's always highly playable in limited (but needs to be more effectively costed for constructed). 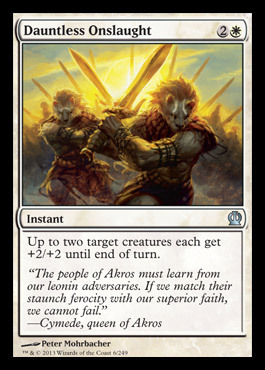 Anyways, stay tuned - according to sources on the Interwebz, Theros should be fully spoiled by this upcoming Monday. Just in time to review in preparation for the pre-release.